Back in November, I celebrated Thanksgiving with my family by deciding I would eat whatever I wanted, regardless of FODMAP. I reasoned that Thanksgiving comes once a year, and that it would be worth it to consume everything I’d been avoiding. After eating the meal, I had stomach discomfort, which I expected, but I also had a migraine that lasted for over 2 days, and such extreme exhaustion that I had to take multiple naps over the course of the holiday weekend. I rarely nap, so this was unusual. Basically, I felt like I was having one of the worst hangovers of my life, and I’d only consumed 1 glass of wine that night. It wasn’t normal. I believed this to be a “one time” thing, obviously having to do with consuming so much food, and so much food that I hadn’t had in several months. But in December, it happened again. Only this time, it was more severe. I was eating Thai food at a restaurant with my friend. I picked a meal that appeared FODMAP friendly, and was happily eating, when I got a migraine. Then my tongue felt thick and heavy, almost swollen. When we got up to leave, I could barely walk straight; I practically staggered toward the door. My chest tightened up, and I wheezed my way home. This time, the migraine went away, but the fatigue stayed on for a few days, as well as stomach discomfort. I feared that being so strict on the FODMAP diet had permanently messed me up. This was when I decided to see a dietitian about my other symptoms. The dietitian helped me re-challenge FODMAP and integrate food back into my diet. Once again, I was feeling good…but then it happened again. I was eating lunch with my co-worker, consuming food I ate on a daily basis, when my throat and chest tightened, I began wheezing, got a migraine, and my nose started running. After about 10 minutes, it was easier to breathe, but the fatigue was severe. This has happened several more times since that last incident, and it scared me…what was going on? Was I allergic to something and didn’t know it? Was it something else? The dietitian I work with believed I was experiencing food sensitivities, along with inflammation, and suggested I complete a MRT-LEAP blood test to determine what foods I was sensitive to. The 4 items in red indicate what I am highly sensitive to and should avoid at all costs, and the yellow indicate what I am moderately sensitive to and should also try to avoid. 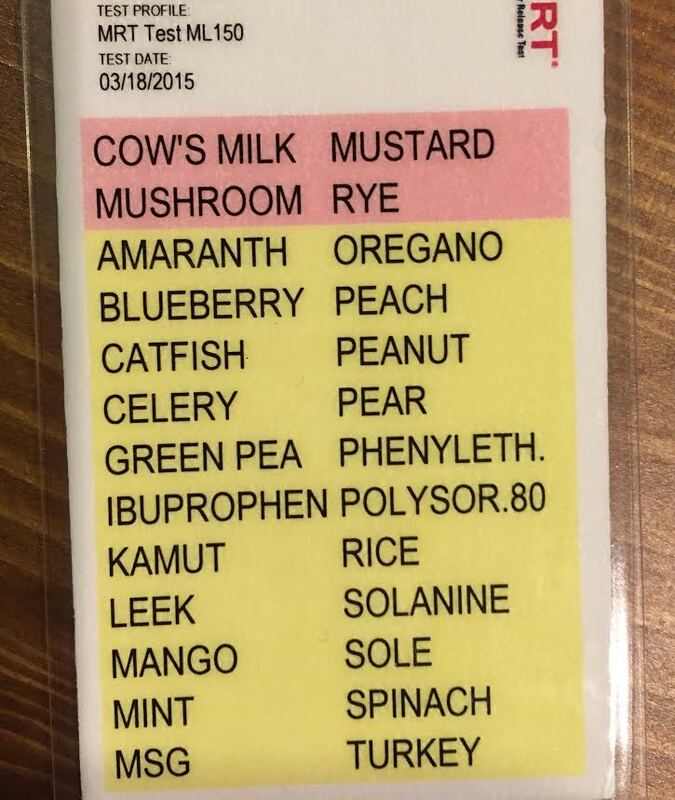 I am a little distressed that I have to avoid mustard, blueberries, mint, peanut, rice, spinach, and solanine. I love mustard, blueberries have become a staple in my smoothies, as has spinach, and I am a peanut butter FREAK. Also, solanine is the compound in nightshades (potatoes, tomatoes, bell peppers), things that I eat DAILY. 1. The food I’m sensitive to could be causing inflammation in my body, leading to those unpleasant symptoms I’ve had. 2. Yet ANOTHER restricted elimination diet. UGH. My dietitian is going to help me by typing up the foods I can eat for 10 days, and some possible recipes, so at least I won’t be totally on my own. But I will be doing a restricted diet through 3 phases, the duration of which is unknown. I start the diet April 20, so I’ll be updating during each phase. I hope this helps with some things, but I’m starting to feel really frustrated that I can’t just eat what I want and I have to go through yet another thing where I’m limited to what I can have. Has anyone ever done this before? If so, what has been your experience?